Tweet Over the last year a friend of mine and I have developed this fascination with Buffalo? I’m not really sure why, but since then it seems like everywhere I look I see the word Buffalo. 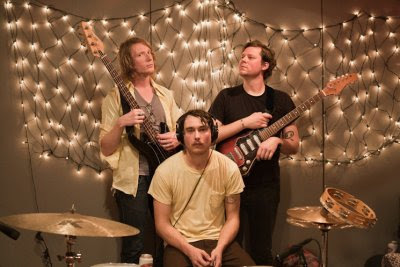 Anybody see “Hot Tub Time Machine?” So when I came across this band Thunder Buffalo I knew I would like them for the name alone, but it turns out they’re a really cool band. Check out our entertaining interview with front man Aaron Schroeder. Q - Where did you come up with the name Thunder Buffalo? A - On a trip into Yellowstone Park I took a mass quantity of psychedelics and ended up freaking out and running from our campsite into the woods during a thunderstorm. I found this field where a bunch of buffalo were grazing and hung out with them for a while in the rain. Then I slept in a nearby cave and when I woke up one of the buffalo was standing over me. I punched him in the nose, and he ran off. Then I thought of the name. Q - If I’m reading an accurate bio, Thunder Buffalo started out as a one man show. At what point did you decide to shape a band around this idea? A - Pretty much after my first gig as a one man act. I was playing at a Seattle bar called Musicquarium located inside the Triple Door. I was really getting into it when one of the guys that worked there asked me to turn down. Apparently they are more of a jazz venue, and my continual over lapping of bowed guitar loops and pounding on a floor tom while howling into a mike didn't really fit their bill. I probably lasted 15 minutes when he came up again and asked me to stop. That's when I decided I wanted more people to do it with me so I could REALLY piss him off! Q - How would you describe Thunder Buffalo’s sound? A - I try not to describe how Thunder Buffalo sounds. If I do, then that means I have to sound like that. I don't want to limit myself. However, if I have to, I will say we sound AWESOME! Q - What is your song writing process? Do you need to be inspired to write? A - I'd say it's pretty natural. I never really sit down and say, "I'm going to write a song now." Usually, I pop in a VHS and just watch a movie with a guitar in my hands. That way half my brain is focused on the movie and not really trying to write a song. Usually a riff or two will pop out this way and when I hit one I like I start focusing more on building it up. Two or 3 movies in and I'll probably have 3 or 4 song ideas I can focus on after the credits. If that doesn't work, I just open a bottle of cheap wine and let that do its wonders. If THAT doesn't work I just don't worry about it. Songs come when they want, why try and force them? Q - What are your touring plans for 2011? A - Right now it's looking like we are gonna go out for a month around SXSW and party down there with some old friends. There is a whisper of a EURO tour in the summer, but we'll see. I need to learn how to speak French first. A - A good time with nice people who like to make new friends.... and I'll probably say something off color at least once or twice. A - Top of my head - Pink Floyd (especially Syd Barrett era), Swans, Comets on Fire, Acid Mothers Temple, Velvet Underground... really though, my main influences are my friends’ bands. Whenever they do something really cool or hit a riff that explodes my brain, it makes me want to do the same thing, right then. So, I try to use that energy and channel it into the songs. Q - What have you learned since recording your last album that you will definitely be applying to your new album? A - Well, everyone keeps telling me they want to hear my vocals more, so there will be that. Also, on the first record I just kinda sang anything into the mike when recording. This time I'm actually writing the lyrics first. So there's that. Other than that, it will probably be a bit drier sounding. I'd don't know what I've learned; I kinda have a thick skull. At least that's what my mom told me when I was growing up. Q - When can we expect a new release? A - Hopefully right after the New Year. I am half done. I've got about 9 songs that just need mixing and another batch of 8 or so that I still need to work up and put to tape. Then it's just a mix and master away. Q - What are some groups or acts that you’re into right now? A - Witch Gardens, (we're) Butts, Palit, Dikes Of Holland, Horse + Donkey, Unnatural Helpers, Diver Down, Prison, Wet Paint, Broomsticks, Cruddy, Glamazon Warriors, Planets, Charles Leo Gebhardt IV, Idle Times, Scraps, The Zoltars, Spurm, Guantanamo Baywatch, Stephanie, Hobocop, Grave Babies, The Shackles, Branden Daniel & The Chics (although I play bass in that band so we will always make this list. We RULE!) I know I'm forgetting bands, and that makes me angry. I also recently found out about the K Holes and have been giving them a few spins. Q - Thanks for taking the time; is there anything you’d like to add? A - I used the above list to make sure more people hear about these bands. These are the people that make me want to push harder with Thunder Buffalo. If it weren’t for them, I'd probably have given up years ago. Also, how did Frodo find out Bilbo had died? He read it in the hobituaries! ZING! Or should I say ZOIKS!!! Thanks for the time to let me ramble.